Great features for an out of the box 1911, especially for the price. I like the ultralight frame for an EDC steel firearm. Best 1911 I could find for the money. Great reputation, solid design, and 50 bucks cheaper than anywhere else. .45 inches of love. I own a Dan Wesson, a Colt, a Kimber, a Para, a Smith, Daily and now a Remington. I my estimation nothing beat the fit and feel of a 1911. 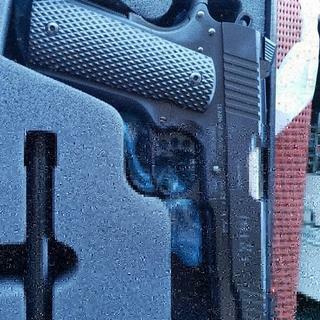 In my estimation nothing beats the fit and feel of a 1911. BEST ANSWER: As I remember when I bought it at that time it came with 2 mags. I bought Chip McCormick mags because I'm old and stuck in my ways re: my 1911's ! Lol it's a great gun! Feeds everything! Hope this helps. Comes with 2 mags. Ive put several hundred rounds through it without any mag issues or FTF. Been very happy with the gun. Mine came with two, eight round mags. Two 8rd Remington (Mec Gar) mags. Great Firearm you won’t be Disappointed! So far threw about 500 rounds threw it and it felt great. A few hang ups but it was expected. The magazines could be better but wasn’t expecting perfection from the price point. Love the gun so far! Change the grips for some personal flare and placed the Remingtons on my Kimber. Overall great gun you won’t be disappointed! Love it, light comfortable accurate. Not a big fan of the sights but that is an easy change. 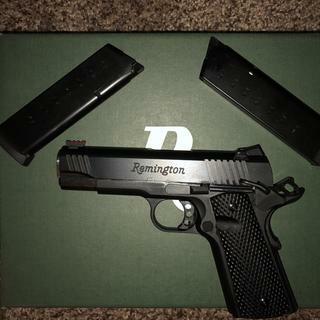 Most certainly recommend this pistol, long Remington fan. A great option for an ultralight 45 cal. 1911 Commander. The pistol looks good and feels good in the hand. Everything fits tight, and the operation is smooth. I have only put 150 rounds through it so far but it's very accurate and there have been no malfunctions. The lightweight frame makes it comfortable to carry IWB all day. The fit and finish of this gun is exceptional especially at this price point. I use this in my local IDPA competitions. It’s takes about 50-100 rounds and a good cleaning for break-in. After that, runs smooth, great trigger, and tight groups. Great experience! Even better prices! Good gun for price...experienced failure to feed but hoping that stops after 1000 rounds. Great look, great feel and great balance. ZERO malfunctions or stoppages of any kind. Shot surpringly soft for a lightweight framed 1911 with 230g ammo. She’s a keeper! I love it. Realy accurate. This thing fits my hand and balances so good it is hard not to shoot it well. Remington has kept it true to it's Para heritage. It handles range ammo as well as person defense stuff equally well. The alloy frame makes this a lite 1911. Easy to manage and easy to sight w the fiber optic front sight. The trigger is short, light and very smooth. This is a tremendous value. Great service and great turn around time on the order. As with all Remingtons, this is a well-built, solid firearm that performs just as advertised. Incredibly lightweight. Strongly recommend. Shoot straight every time. Ultra light, my every day carry. Can’t go wrong with this 1911. Reliable! My first 1911. Haven’t found a thing I don’t like about it. The fit and finish are excellent. The pistol functions flawlessly. This is a great pistol and my opiniomn is it s underpriced. I retired my Colt Wiley Clapp commander and use the R1 as my everyday carry. It's has a nice finish, tight tolerance and feels good in your hands. It's also very accurate. I have put a few hundred rounds through it without any issues. I clean it after every use, just out of habit. It's my first 1911, so taking it down and reassembly is a bit more of a fuss than what I am used to. One star off for the cheese grader grips. Otherwise, a solid 1911 under $550.00. I like it. This pistol is extremely lightweight for a 1911. Recoil was surprisingly non-abrasive and it's extremely accurate. Best 1911 out of the box period! Little tuning and tweaking just keeps getting better! Ordered Sunday, my FFL called Tuesday to let me know it was in. Fastest shipping yet from GAG. First 100 shots flawless and right on target. Amazing how accurate I was shooting this gun. Recoil honestly feels less than my Ruger SR9 I'd that is possible. I know I shoot it better than the SR9 and my PPX 40 cal that I thought wad my best shooter, until I got this baby.Takedown and reassembly is a PITA compared to every other gun I have owned. It takes practice I guess. My first 1911 and could not be happier if it continues to function without issues. I was a bit hesitant of this platform with all the excess moving parts over modern day firearms. I don't plan on putting 10,000 rounds through it, so may not even have to worry about additional maintenance. Time will tell.Remington has a weak 2 yr warranty opposed to other brands, so that could be a negative in the future If anything goes wrong. I am hopeful it will provide years of worry free service. This is my 2nd 1911, first being the R1 Carry full size. The value for this handgun is unbeatable. It's almost 10oz lighter than my R1 Carry and the trigger is absolutely amazing. "Ultralight" applies to the trigger also y'all. Lighter and smoother than the R1 Carry, I've got to upgrade my R1 Carry trigger now so it can keep up. The R1 Carry was $200 more. So far I'm 210 rounds in, no malfunctions, using Wilson 47D's and mec gar factory Remington mags. Find a better bang for your buck, bet you won't find one. Outstanding pistol. Amazing accuracy right out of the box. Lightweight and exelent fit and finish. Perhaps one of the finest pistols I own.